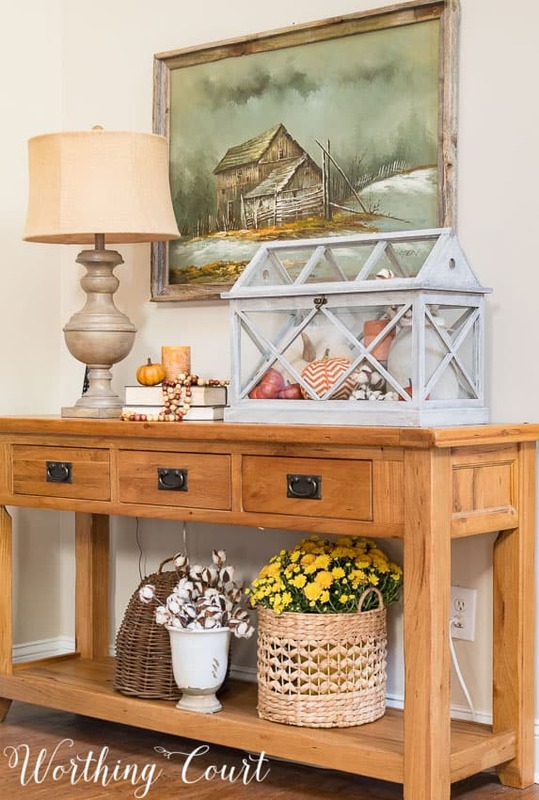 I’m popping in very quickly today to show you one more spot in my house that I’ve added fall touches to. Do you remember when I showed you my Fall Coffee Table – Two Ways? In that post, I promised that I’d show you where I moved the terrarium to and here it is! I almost chickened out and didn’t share it with you because I totally forgot to remove the phone that sits on one end and move all of the electrical cords out of sight. But, you know what? This is the real world and real life – my electrical cords aren’t always hidden and this really is where our extra telephone lives. So, just ignore them – m’kay pumpkin? This long console table is located on the wall that is adjacent to one end of our couch. I’ve never been really happy with it – it just always looked off to me somehow. Here’s how the table looked for my Country Living Spring Home Tour. I just noticed that I forgot to move the phone and cord in this photo too. Ha! I decided to try replacing the round mirror that was hanging above the table with a painting that I picked up at a yardsale for $5 a few years ago. The lamp was too similar in color to the wood of the table, so I gave it a dry brush with gray stain. Those couple of simple changes made all the difference to me! Here’s another look at how it is today. I do love this terrarium and while I think it was too large for my coffee table, I think it’s perfect in this spot! So now I have a question for you. Do you struggle putting vignettes together? Leave me a comment here letting me know. If you’d like for me to, I thought we could take a closer look at a few things and I could show you how they came together. The table is absolutely beautiful and so inviting. 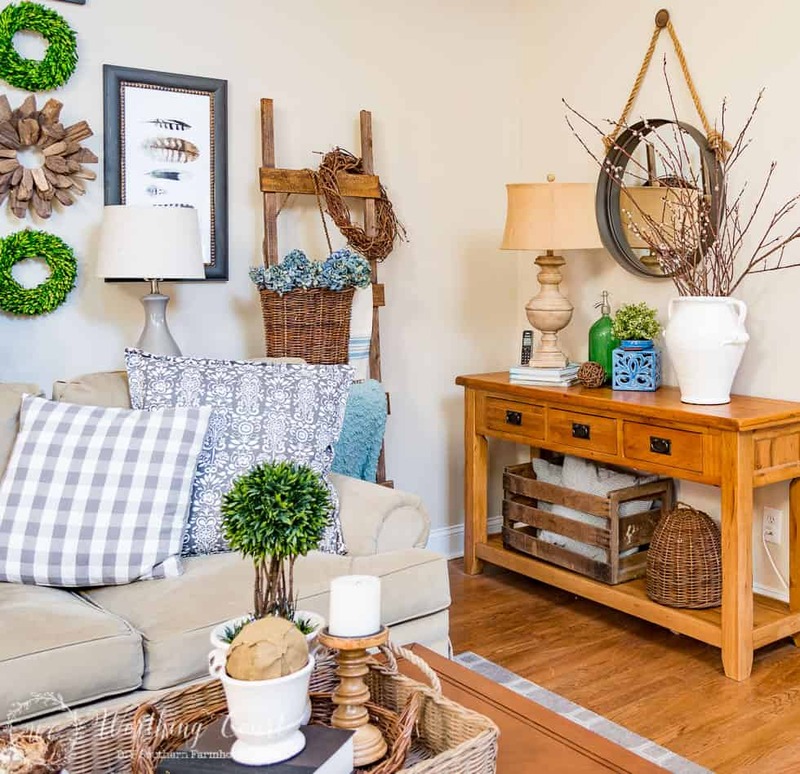 Everything from the terrarium to the way you decorated the base of the table with the wicker baskets and flowers is gorgeous. Love the way you added bits of blue. I would love for you to redo my family room. Your style is my style; however my inherited antiques and burgundy Karastan rug are here to stay. Not only do I struggle with vignettes, I struggle with all my decorating! I think it’s time you come to Florida for all my decorating needs! I ‘ll get a buddy-pass for you from my son who is a crew member for Spirit airline. That way, my home will be just as beautiful as yours!! Second comment: I just thought that maybe part of the problem is, I don’t have many excessories to decorate with. I shop all the time at the home stores, but I’m not sure what to purchase. Do I just randomly buy things that I think I like? Give me some suggestions or tips on this? Your post is great. I agree with Nancie when it comes to accessories. It seems like I have a lot of them, but not the right ones! I do like the picture on the wall with this vignette. Beautiful home. The table looks great and if you hadn’t pointed out the phone, I never would have noticed it! The picture struck me immediately, perfect! That was where my attention was focused. Interesting how sometimes the most inexpensive item has the most impact. One women’s trash is another’s treasure, so true. Again, cozy feel to the picture. I keep using the word cozy to describe your home. Great touch to the lamp. Thanks for suggesting a simple solution. I agree, the picture is a better fit. I loved in your fall mantle post the small shutters you used. I may have to but a terrarium cuz the lantern I thought would be large enough to decorate is not bad g enough to really make an impact. Thanks for all the great ideas! Love your terrarium and its new location. Everything looks so cozy! Love your space. That painting is a keeper. I love terrariums. They are so much fun to decorate. I like the colors they all blend so well. Very welcoming. End tables, and other tables in the LR. How do I decorate them? Also the mantle? I definitely love the painting vs the mirror. I think it’s a wonderful vignette. I’m going to check out all the other blogs too. Thanks for sharing; always love your look and decor. Beautiful. I too would not have noticed the phone. Me again….where did you get the terrarium? Whee should I look for one? Suzy can I tell you, I adore every touch of all in yo ur home. T his is no different and this terrarium is gorgeous. I may have to look for one. I do enjoy this site. I see so many new ways to decorate and I just love it. Thank you. I love the terrarium! And you’re right…the phone and cords are real life! I have to ask…where did you get the table. I’m looking for that exact table; I’ve seen it in other blogs and I love it! Hi Joannie. I found mine at a local furniture store. Here are links to two options for you that aren’t exactly like mine, but are similar and have drawers for storage: http://rstyle.me/~8Xf88 , http://rstyle.me/~8Xf9u . Sorry I couldn’t be more help! Everytime I receive your new posts, Suzy, I find another idea or two! 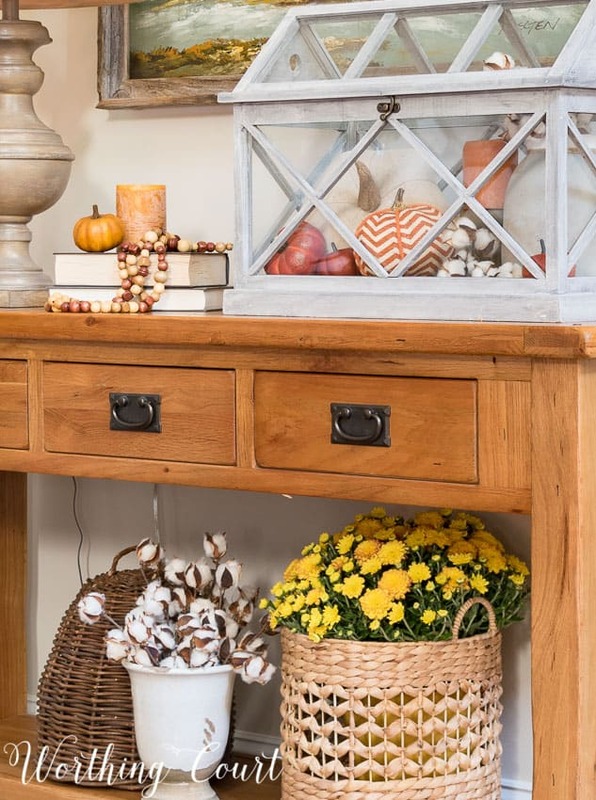 This time it was in looking back at your Spring view of the Fall table: I love the basket of hydrangeas hanging on the ladder, and the wreath, placed over one of its posts! Such simple things anyone could do, but for me, you have shown unique ways to bring color to white walls w/o hanging everything directly on them. I love the change to the painting! Its size seems more fitting! And as to the “cords” ~ most readers probably didn’t even notice them ~ we’re looking at all the “goodies!” and everyone’s got them! Always love chances to see your talent in action … and how to assemble vignettes sounds like a really interesting idea! Hi Pam. I apologize for taking so long to reply to you – it’s been crazy town around here lately! I found mine at At Home, but I’ve seen them at all sorts of stores – HomeGoods, TJ Maxx, Marshall’s, Hobby Lobby and Michael’s, to name a few. I love the changes you made with the terrarium. Your posts have made me try so many different accessories in different places. Loved your post. You must surely enjoy strolling through your lovely home everyday! 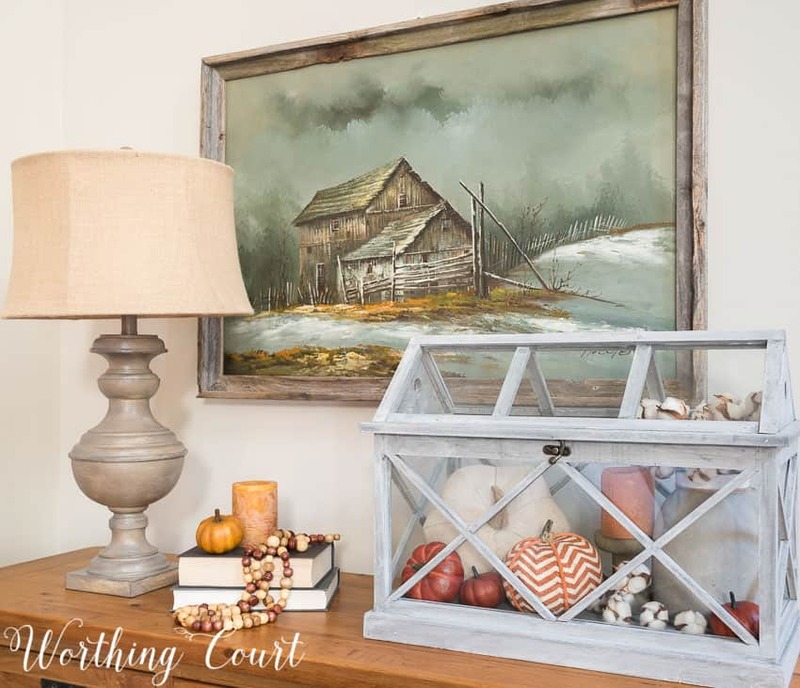 You have an excellent eye for decorating and I know these upcoming winter seasons are on your ever-decorating mind! 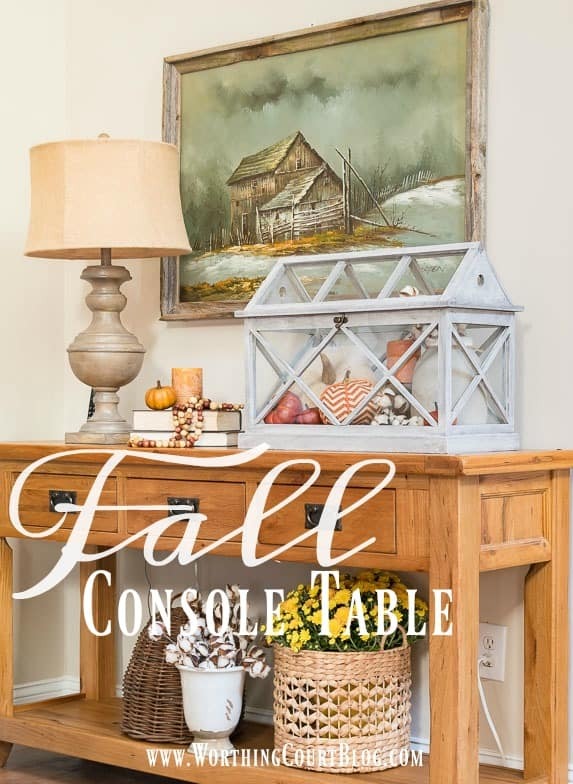 Love your blog and your Fall table! Always look forward to each post! I love How you mix and match colors and different textures. Looks great ! Fall is just about behind us, but how did I miss this vignette? I love it. I love the picture of the old buildings! You must tell me where you got the picture.! I love pictures with views of yesteryear, old buildings, trees, farm implements! A country girl at heart. Yes, I definitely have problems with vignettes. I usually copy from others. Believe it or not, I can see with a few changes how this could be a Christmas vignette. I can see the terrarium with Christmas things in it. I do love your blog and all your postings. looking forward to seeing Christmas postings. Hi Mary. That picture was a yard sale find for $5! Happy Thanksgiving to your and your family as well! It is awesome to see even bloggers take pictures and you can see something in the photos you forgot to remove! Thank you for keeping it real! I love the terrarium and your console table. I’ve always loved console tables, but don’t have room in my house now. However, we are moving in a year or two, so I’m looking for lots more room. Blessings and Happy Thanksgiving!